Does Your Canopy Turn When You Land? Does your canopy turn when you land? The most common cause of this is when the pilot looks to one side instead of straight ahead, creating a chain effect. We tend to go where we look. As you enter your flare, if you look down and in either direction, your body will want to go that direction. Try standing in front of a mirror and hold your hands at chest level a few inches in front of your body, then look down at your right foot. Look back in the mirror; you will more than likely notice that your right hand is slightly lower than your left hand. When you do this under canopy, this starts a slight turn to the right. At the same time, you will tend to reach towards the ground with your right leg, unevenly loading the harness and thereby adding to the turn. As the turn progresses, your instinct to reach out to break your fall starts to overpower your training to fly and of course, the further you reach the more aggressive the turn becomes. How can you fix this? Simply by looking ahead where you want to go. On final, you should be looking ahead of you with your focal center point approximately 45 degrees below the horizon. Once you have entered the flare and begun to swing forward towards the leading edge of your canopy, you should shift your focus directly ahead, a couple hundred feet in front of you. You should be aware of what’s in front of you. This will also help you keep your flare even as you finish. It may help you to lean forward over your hands after you have reached chest level. This will make finishing your flare evenly easier and help keep your focus ahead of you. Remember to look where you want to go. 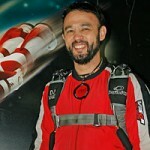 As always, if you have any questions about canopy flight, ask one of our instructors!